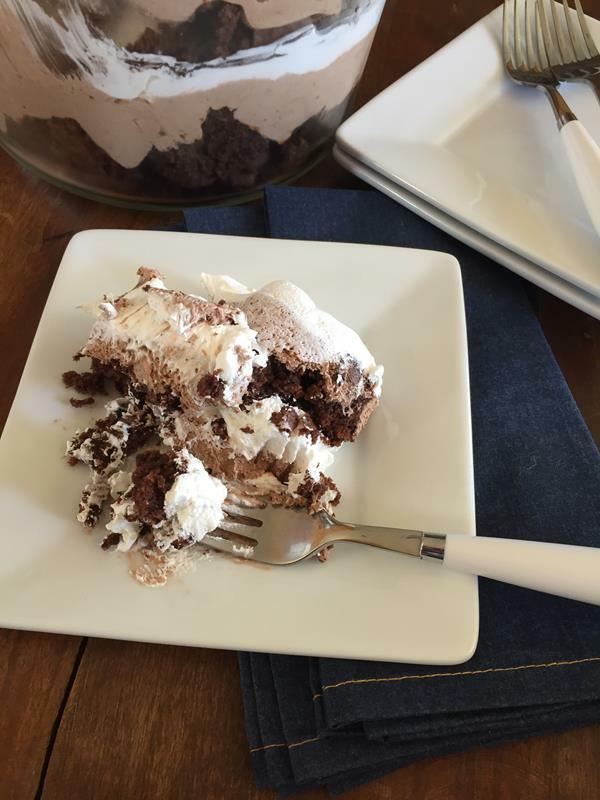 Brownie Trifle is an easy and delicious dessert. It looks great layered in a glass bowl and serves a crowd. Brownie Trifle is a recipe that I have been making for over ten years. I love how easy it is to make. 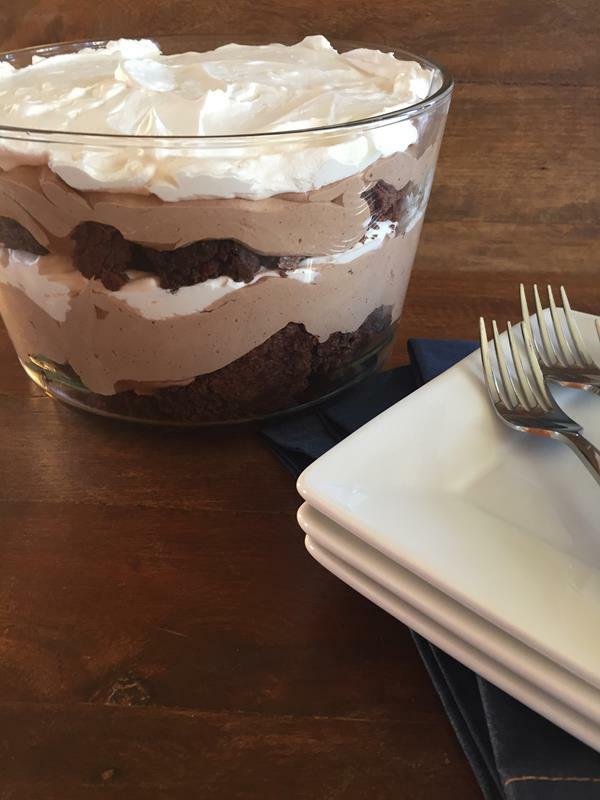 This trifle is a brownie layer, a pudding type layer, and Cool Whip layered in a glass bowl. So easy and so delicious. I love that I can make this with whatever type of brownie that I want to. A basic boxed brownie is the easiest. A gluten free brownie works great for a gluten free dessert that is so good no one will know it is gluten free. Last Friday I needed a quick and easy dessert to take to a family dinner and the first dessert I thought of was this trifle because everyone loves it. Over the years I have taken this to many family dinners, church dinners, picnics, and more. It is a great dessert for a big group because it serves quite a few. This dessert is so good I rarely have any left when I take it places and I have shared the recipe more times than I can count. During the summer I often add strawberries or raspberries to the layers. It is a fun and easy way to change it up and berries and chocolate are always good together. If you need an easy dessert that feeds quite a few people and looks really nice, give this recipe a try. You will not be disappointed! 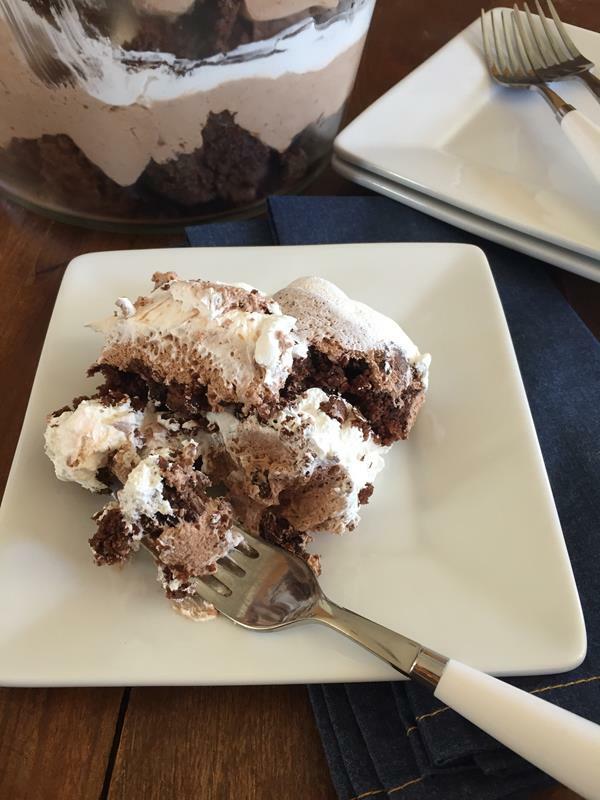 Chocolate Brownie Trifle is an easy dessert that feeds a crowd. In a trifle bowl or glass serving dish, place half of the brownies, half of the pudding mixture and half of the remaining whipped topping. Repeat layers. You can use a homemade brownie mix or a homemade gluten free brownie mix for this recipe. I woke up craving chocolate so I could literally just dive into that bowl! Oh my! Oh yummy. That looks good and not difficult. Oh boy! That looks really yummy! That looks absolutely divine!! Thanks for sharing! HOLY COW! I could eat me some of that right now!! Wow, that looks delicious and easy! Bookmarking it, thanks! .-= C. Beth´s last blog ..Your strength, my weakness =-. Looks Yummy….Will try to upgrade to a healthier version with homemade versions this weekend, shouldn’t be too hard! Thanks for the awesome dessert idea! that looks sooo good im so gong to use that for cristmas. I recently purchased a triffle (which I have never tried a triffle before) at a dessert auction, benefitting youth for summer camps. The triffle made by a 15 year old boy was AMAZING. I ate it for days, gained plenty of weight and dreamt about it’s delisiousness. When I tried replicating it, I was sorely disappointed. So, I asked him for the secrect recipe…that gooey, wonderful layer of something choclately that I couldn’t figure out, what it was. He told me it was cool whip, sweetened condesnsed milk, water and chocolate pudding, but he didn’t know the quantities. That’s when I hit pinterest and found your MAGICAL triffle recipe. It was a HUGE hit last night at my house with my family and our picky friends. Thanks for sharing, this will be a family favorite for years to come. I am so glad that you found my site and enjoyed that recipe. We love it and I am glad your family did also. And wow so glad to know that a 15 year old boy enjoys cooking and was raffling a dessert off. That is so neat to hear! Thanks for letting me know. Than for sharing this awesome recipie I only got this a few weeks ago and have already made it 3 times. I shared on my blog Thanks so much for this! I’ve made this before and love it!